Earth, 2130: Light armored vehicles scout vacant city streets amid the rubble of buildings hiding infantry preparing for ambush. In the distance, sleek grav-tanks hurtle toward the city's perimeter, dodging harassing fire from attack VTOLs and lumbering walkers awaiting their approach from the city’s edge. Missiles scream overhead. Explosions and gunfire echo between dark skyscrapers long abandoned, suddenly lit from incoming fire. Your men await your command. New to miniatures gaming? Boxed games include everything you need to get started- including miniatures from several reputable manufacturers. Perfect for those new to tabletop wargaming. Read an in-depth post about the Concept of Polyversal on the Collins Epic Wargames blog. "The game is quick, it’s tactical and has a great command and control mechanism, so it’s perfect for playing large sci-fi games." "Polyversal has a lot going for it; an engrossing story line and framework for gamers to help build upon and expand, astounding art from Bruno Werneck, a self-contained box set with elegant, streamlined rules that you can put right on the table, and an open system from which you can adopt your own models to, in any timeline you wish." Creating Combatant Tiles of your own by Ken Whitehurst. Click to view the 2-min. video. Included Design Rules for Polyversal and templates can handle creation of Combatant Tiles for any vehicle, walker, aircraft, or infantry unit you can imagine in a simple step-by-step process. A points-based system balances all of the options. Create variants with different targeting systems, special abilities, special armor, various weaponry, etc. Upload a photo of your miniature as the artwork. Watch the Gameplay video for an overview of the turn and combat. You can also print-and-play this example by following the link below, adding dice and a few proxy miniatures and play it out. Remember, the pnp doesn't include the full rules. Watch the Command and Control Preview video for more detailed information about Orders and Activation, Command Units, Units in and out of Command Range, Battlegroups, and more. Polyversal does not lock you into a particular story. You may generate your own background, or simply play the game. We have a compelling story framework that sets the tone for the conflict we envisioned within Polyversal. It is set on Earth and focuses on the battles of a future, powerful United Nations (UN), and groups of Opposition Forces (OPFOR) who fight for survival, sovereignty, and a chance to flee Earth. "We will provide the framework of our setting through a wiki-style site that allows players to contribute." "We do not make miniatures, nor do we compete with the great companies who do." In order to create boxed games of Polyversal and introduce players to a wide range of what's out there, we partnered with five high quality 6mm/10mm miniatures manufacturers and one terrain manufacturer. "Our goal is to bring the sci-fi wargaming community together in a single rules system compatible with everything." Boxed games include your choice of several options of miniatures grouped into "Battlegroups" from each of our partner’s lines along with Combatant Tiles we design with professional artwork for each model. "Several of our partners are offering Limited models that every backer at the Adjutant level and higher will receive FREE!" Each boxed game includes everything you need to play and features some amazing miniatures with pre-designed Combatant Tiles. If you prefer to support the game without miniatures (adding your own and designing your own Tiles for them), we recommend the Adjutant pledge level. "Each Battlegroup is a grouping of miniatures that work well together. Each includes Combatant Tiles." Boxed Games include multiple options for Miniatures. See below. UN (United Nations) Battlegroup A "Quick Reaction Force"
UN (United Nations) Battlegroup B "Peacekeepers"
OPFOR (Opposition Forces) Battlegroup A "Minutemen"
OPFOR (Opposition Forces) Battlegroup B "Texas Militia"
Note: Quantity listed is total included models. By default, models are supplied unpainted. However, we can paint them for you for an additional fee as noted in the Pledge. In general, the painting fee is $200 per painted battlegroup, which also applies to add-ons. IMPORTANT - ACTUAL SHIPPING COSTS ARE INVOICED THROUGH OUR SURVEY / BACKERKIT AFTER THE KICKSTARTER IS SUCCESSFUL and JUST PRIOR TO SHIPPING. This is done for many very important reasons that ultimately helps save everyone money and is further discussed in this blog post by the publisher. Shipping will be calculated prior to shipment of your rewards and/or add-ons in order to be the most accurate we can be, not charge over, and not charge under the amount needed to ship. Shipping is in addition to your pledge total and is based on your shipping destination at the time you respond to our survey. Again, this is charged and handled outside of the Kickstarter campaign. USA, Canada, European Union, and Australia are all "friendly" shipping. These particular zones and the "rest of the world" have different estimated rates. From within the "Friendly" zones, we ship through consolidators who will receive our items in bulk and individually ship to you, saving you from having to pay customs fees or other taxes. For international shipments to the "rest of the world" (not covered by a "friendly" region noted above), you may be required to pay import duties imposed by your country. We do some additional leg work in major zones to save you money. EU Friendly - All rewards ship from within the EU to an EU destination, saving you on shipping and import duties if you are in an EU country. Canada Friendly - All rewards ship from within Canada to a Canadian destination, saving you on shipping and import duties if you are in Canada. Australia Friendly - All rewards ship from within Australia to an Australian destination, saving you on shipping and import duties if you are in these areas. USA Friendly - We are a USA-based company and handle all USA shipping using USPS. There are no extra taxes or fees for USA shipments. For Virginia residents, we will report and pay any sales tax on your behalf. Supporting Polyversal helps us make this game a reality. You help us fund final development, artwork, and production costs for physical components including large special casting runs by our partners. In return, we give you everything from a Thank You in the rules to an amazing new game. For pledging at the Adjutant level on up, you will also receive several retail limited miniatures and 1 terrain item from 3 of our partners. Limited* Release 1 - Brigade Models - Set of 3 "M-65 Ridgway Light Combat Walkers" (unreleased). Limited* Release 2 - Plasmablast Games - Daeger Fighter (unreleased). Limited* Release 3 - The Phalanx Consortium - Executive Spaceport (unreleased). * These models are currently unreleased and will be released through our Kickstarter. They will not be available anywhere except through our Kickstarter for at least 6 months after we receive them. Credit - All rewards include a Thank You in the rulebook by listing your name as you want it to appear. PDF Rules - All rewards that include printed rules or a physical boxed set also include a PDF version of the rules. Multiple Rewards - To pledge for multiple copies of any reward, please multiply your pledge by the number of copies desired. We will group your shipment together and our Pledge Manager will help us ensure you are not overcharged shipping. You will be charged the actual shipping cost of the total shipment. Thank You for supporting Polyversal! We will list your name in the rulebook. Please do not apply add-ons to this support level- it does not involve shipping- nor does it include stretch rewards. UN Representative - Please make this your Avatar! PDF copy of the Rulebook. Includes Unit Design Rules and Templates for custom Combatant Tiles. This is an electronic copy of the rules. Please do not apply add-ons to this support level- it does not involve shipping. NOTE: This support level does not include stretch rewards. Perfect for the customization gurus out there and those who have large miniatures collections. Printed and PDF rules, Combatant Design Rules and templates, 15 polyhedral dice, orders tokens, quick reference cards, and tracking counters in the Polyversal retail box. This is the full game minus miniatures and their associated combatant tiles offered in the higher reward levels. Note that you’ll need to create your own combatant tiles for any miniatures you bring into the game using our Design Rules and add your own miniatures in order to play. Good for those wanting to try out Polyversal using a single Battlegroup. Printed and PDF rules, Combatant Design Rules and templates, 15 polyhedral dice, orders tokens, quick reference cards, and tracking counters in the Polyversal retail box, plus your choice of 1 of 4 Battlegroups (See Components Section) with associated Combatant Tiles. Great for those who want two Battlegroups of miniatures with Tiles pre-made in order to get playing quickly. Printed and PDF rules, Combatant Design Rules and templates, 15 polyhedral dice, orders tokens, quick reference cards, and tracking counters in the Polyversal retail box, plus your choice of 2 of 4 miniatures Battlegroups (See Components Section) with associated Combatant Tiles. Great level to get all of the UN and OPFOR models with tiles! Printed and PDF rules, Combatant Design Rules and templates, 15 polyhedral dice, orders tokens, quick reference cards, and tracking counters in the Polyversal retail box, plus your choice of 4 Battlegroups (See Components Section) with associated Combatant Tiles. You are all in! Printed and PDF rules, Combatant Design Rules and templates, 15 polyhedral dice, orders tokens, quick reference cards, and tracking counters in the Polyversal retail box, plus your choice of 5 Battlegroups (See Components Section) with associated Combatant Tiles. You may add the following to any pledge level from Adjutant and higher. Note that this may slightly increase our actual shipping costs to you and we will adjust our shipping invoice accordingly. If you have any questions regarding add-ons, please let us know. We have funded beyond our initial goal, unlocking various Stretch Rewards for everyone who backs this project from the Adjutant pledge on up. 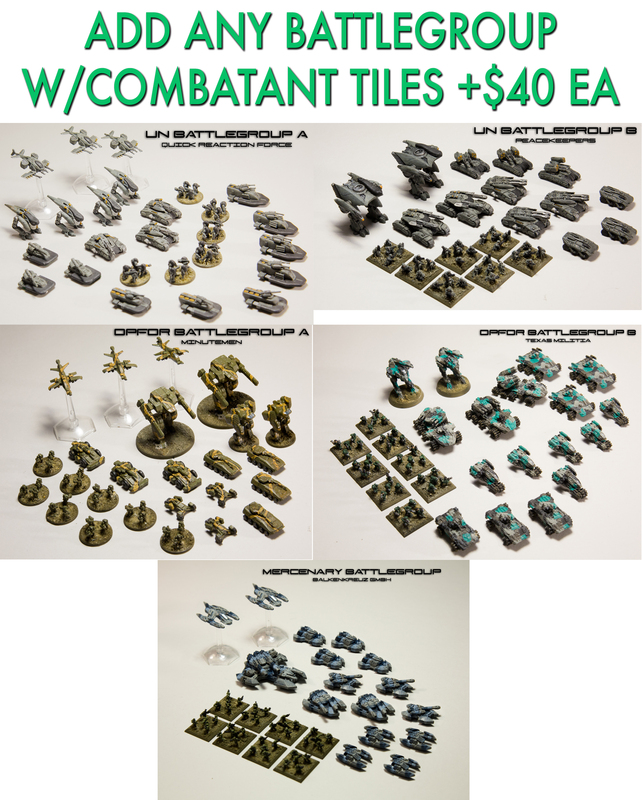 Stretch Goals that include additional models also include a Combatant Tile. Read many more replies in this blog post. Have plans for Polyversal? Please let us know! 1) If we mess something up (ship you the wrong item, forget something, shipping damage occurs, etc., we will make it right at our expense. 2) If for any reason you are not satisfied with your purchase, you may ship it back to us for a full refund of your pledge amount plus any shipping we collected from you after the campaign, no questions asked. "Pledge with confidence. You're supporting a small publisher known for quality. We back that up with our guarantee." Are you on Twitter? Make this your header image during the KS! Thank You for Supporting Polyversal! Risk 1: We are working with multiple companies to put together Polyversal's boxed versions and other items. While we do have contracts with each company, there is a potential for any of them to cease operation prior to fulfillment. Risk 1 Mitigation: By working with multiple manufacturers, we mitigate Risk 1 with the ability to adjust the game's set contents if one manufacturer cannot fulfill their contract. Adjustment may include substitution of a model from another manufacturer that will suit the design intent and will be of equal or greater value if this option is required. If this happens, we will let you know. Risk 2: Delays on Fulfillment due to unforeseen issues or circumstances. Risk 2 Mitigation: We are working well in advance of project completion with each manufacturer including our printers and our artists to set realistic timelines for delivery of each component of the game. We believe that reward delivery timelines set in the reward levels are realistic. Rest assured, even if there is a delay for some reason, we will keep communication up and let everyone know what's going on. No one is more driven and passionate about delivering this game than us. UN Representative – Thank You for supporting Polyversal! We will list your name in the rulebook as a supporter. UNEP Engineer – PDF copy of the Polyversal Rulebook. This is an electronic copy of the rules that also includes the design system for manually creating your own combatants. MSRP: $20 USD. No Shipping Involved. Adjutant - One copy of the boxed game WITHOUT miniatures or combatant tiles. This includes PDF and printed copies of the rules, orders tokens, tracking counters, 15 polyhedral dice, and quick reference cards, plus all limited models and stretch rewards. You will need to use the Design Rules to create your own Combatant Tiles. MSRP $55 USD. Ships worldwide. EU, CA, AU, US friendly. Actual Shipping Invoiced after the Kickstarter Campaign ends (See Project Page for Estimates and More Info). Elite Unit – One copy of the Polyversal boxed game with your choice of any 1 faction and their associated Combatant Tiles, plus all limited models and any Stretch Rewards unlocked. This includes PDF and printed copies of the rules, orders tokens, tracking counters, 15 polyhedral dice, and quick reference cards. This is everything you need to get into and play Polyversal with a single faction. It is recommended to use our Design Rules to create your own second faction. Add $200 to receive miniatures fully assembled and painted. Not planned as a retail product. Ships worldwide. EU, CA, AU, US friendly. Actual Shipping Invoiced after the Kickstarter Campaign ends (See Project Page for Estimates and More Info). Battlegroup Commander – One copy of the Polyversal boxed game with your choice of any 2 factions and their associated Combatant Tiles, plus all limited models and any Stretch Rewards unlocked. This includes PDF and printed copies of the rules, orders tokens, tracking counters, 15 polyhedral dice, and quick reference cards. This is everything you need to play Polyversal as well as customize and expand it. This is our recommended basic support level to get you into the game with 2 factions. Add $400 to receive miniatures fully assembled and fully painted. MSRP $160 USD. Ships worldwide. EU, CA, AU, US friendly. Actual Shipping Invoiced after the Kickstarter Campaign ends (See Project Page for Estimates and More Info). UN Special Envoy – One copy of the Polyversal boxed game with all 4 factions and their associated Combatant Tiles, plus all limited models and any Stretch Rewards unlocked. This includes PDF and printed copies of the rules, orders tokens, tracking counters, 15 polyhedral dice, and quick reference cards. This is everything you need to play Polyversal as well as customize and expand it and includes all of the miniatures we offer. 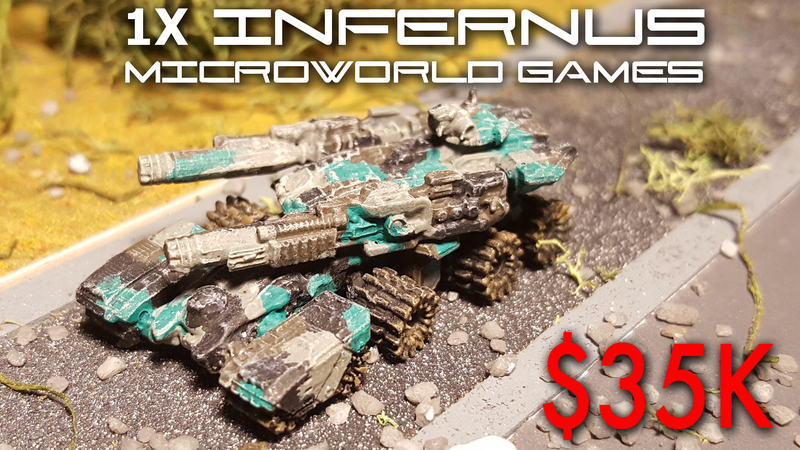 Add $800 to receive miniatures fully assembled and fully painted. Not planned as a retail product. Ships worldwide. EU, CA, AU, US friendly. Actual Shipping Invoiced after the Kickstarter Campaign ends (See Project Page for Estimates and More Info). UN Security Council – One copy of the Polyversal boxed game with your choice of 5 factions and their associated Combatant Tiles, plus all limited models and any Stretch Rewards unlocked. This includes PDF and printed copies of the rules, orders tokens, tracking counters, 15 polyhedral dice, and quick reference cards. This is everything you need to play Polyversal as well as customize and expand it and includes all of the miniatures we offer. Add $1000 to receive miniatures fully assembled and fully painted. Not planned as a retail product. Ships worldwide. EU, CA, AU, US friendly. Actual Shipping Invoiced after the Kickstarter Campaign ends (See Project Page for Estimates and More Info).